This page will walk through Spring Boot Data Redis example. Redis is an open source, in memory data-structure store that can be used as database, cache and message broker. Redis supports data-structure such as strings, hashes, lists, sets etc. Redis is a NoSQL storage and uses key/value to store data. Spring Boot provides spring-boot-starter-data-redis for Redis dependencies. Redis connections are obtained using LettuceConnectionFactory or JedisConnectionFactory. Lettuce and Jedis are Java Redis clients. Spring Boot 2.0 uses Lettuce by default. Spring Data provides RedisTemplate as the central class to interact with data in Redis store. To interact with string data, we can use string-focused extension StringRedisTemplate of RedisTemplate. Spring Data provides ListOperations, SetOperations, HashOperations etc to perform operations on Redis data and we can directly inject them in our Spring applications. 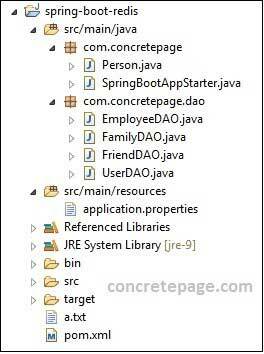 Find the project structure of our demo application in Eclipse. Spring provides spring-boot-starter-data-redis to resolve Redis dependencies. It provides basic auto configurations for Lettuce and Jedis client libraries. By default Spring Boot 2.0 uses Lettuce. To get pooled connection factory we need to provide commons-pool2 dependency. Find the Maven file. Spring Boot 2.0 starter spring-boot-starter-data-redis resolves Lettuce by default. Spring provides LettuceConnectionFactory to get connections. To get pooled connection factory we need to provide commons-pool2 on the classpath. To work with Lettuce we need following Maven dependencies. To configure Lettuce pool we need to use spring.redis. * prefix with Lettuce pool connection properties. Find the Lettuce pool sample configurations. We can override default Redis host, port and password configurations. Use max-wait a negative value if we want to block indefinitely. By default Spring Boot 2.0 starter spring-boot-starter-data-redis uses Lettuce. To use Jedis we need to exclude Lettuce dependency and include Jedis. Find the Maven dependencies to use Jedis. jedis dependency will automatically resolve commons-pool2 on the classpath. To configure Jedis pool we need to use spring.redis. * prefix with Jedis pool connection properties. Find the Jedis pool sample configurations. ListOperations is used for Redis list specific operations. Find some of its methods. leftPush(K key, V value): Prepends value to key. rightPush(K key, V value): Appends value to key. leftPop(K key): Removes and returns first element in list stored at key. rightPop(K key): Removes and returns last element in list stored at key. remove(K key, long count, Object value): Removes the first given number (count) of occurrences of value from the list stored at key. index(K key, long index): Fetches element at index from list at key. size(K key): Fetches the size of list stored at key. Now find the example of ListOperations. Here we are performing create, read and delete operations. SetOperations performs Redis set specific operations. Find some of its methods. add(K key, V... values): Adds values to set at key. members(K key): Fetches all elements of set at key. size(K key): Fetches size of set at key. remove(K key, Object... values): Removes given values from set at key and returns the number of removed elements. Now find the example of SetOperations. Here we will perform create, read and delete operations. HashOperations performs Redis map specific operations working on a hash. Find some of its methods. putIfAbsent(H key, HK hashKey, HV value): Sets the value of a hash hashKey only if hashKey does not exist. put(H key, HK hashKey, HV value): Sets the value of a hash hashKey. get(H key, Object hashKey): Fetches value for given hashKey from hash at key. size(H key): Fetches size of hash at key. entries(H key): Fetches entire hash stored at key. delete(H key, Object... hashKeys): Deletes given hash hashKeys at key. Find the example of HashOperations with create, read, update and delete (CRUD) operations. StringRedisTemplate is the string-focused extension of RedisTemplate. Most of the time we perform Redis operations with string and hence Spring Data provides a dedicated template i.e. StringRedisTemplate. Here we will discuss opsForValue() method of StringRedisTemplate that will return ValueOperations. Find some of ValueOperations methods. setIfAbsent(K key, V value): Sets key to hold the string value if key is absent. set(K key, V value): Sets value for key. get(Object key): Fetches the value of key. Now find the example of CRUD operations using StringRedisTemplate. RedisTemplate is the central class to interact with the data in Redis store. It performs automatic serialization and deserialization between the given objects and binary data stored in Redis. To inject RedisTemplate in our Spring Boot applications, we need to create RedisTemplate bean in JavaConfig as following. Now we can inject RedisTemplate in our DAO and can use it as following. Here we are creating Spring Boot main class to execute the application and will test our DAO classes. System.out.println(friendDAO.getFriendAtIndex(1)); //It will return null, because value is deleted. System.out.println(userDAO.getUserName()); //It will return null, because value is deleted. To test our demo application, find the steps given below. 1. Install and start Redis using the link. 2. If you are using Windows OS, you can install Cygwin first and then install Redis in it. 3. Redis will start on localhost at port 6379. 4. Download the project source code. Go to the root folder of the project using command prompt and run the command.